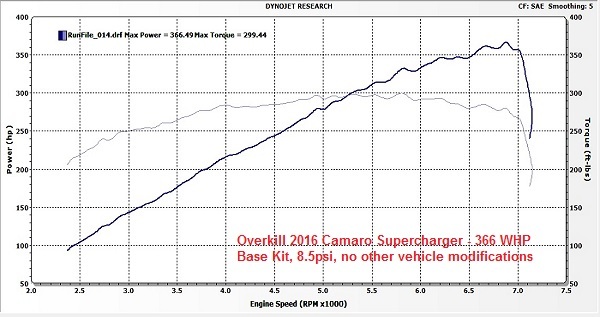 Welcome to the Overkill supercharger system for you 2016 and newer Camaro 3.6 V6. As GM V6 specialists, we're proud to be the first and only company supercharging the newest 3.6 LGX engine in the Camaro and this system is set to change the game for the Camaro6 V6 community. 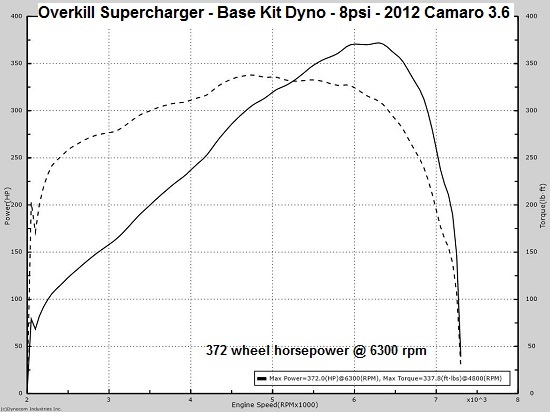 The Overkill supercharger system allows you to bolt on 100+ horsepower gains in a weekend, using our Stage 1 base kit. Add our optional add ons like Stage 2 reach and exceed beyond SS V8 power levels. The Overkill system is 100% bolt on installation you can do in a weekend. You are not required to have any other modifications on your vehicle. 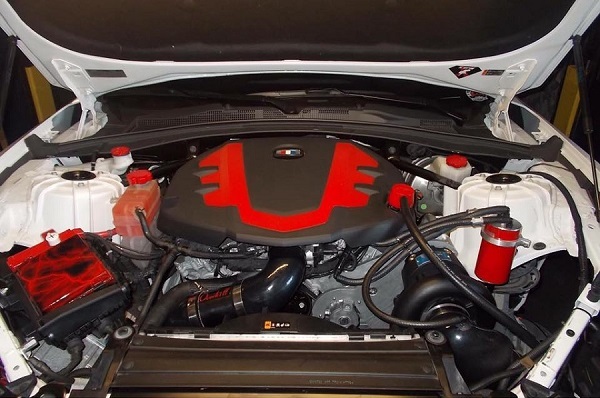 Every requirement to install a supercharger on your Camaro V6 is included in this kit, including going above the normal expectation with our catch can system to improve engine operation and lifespan, and our fully included custom tuning service. Overkill Tuning Service with HP Tuners Pro - This is a tuning suite that runs on a windows based laptop computer and connects your laptop to your vehicle with a cable. Overkill renders all the tuning for this supercharger kit with email exchange, you're simply required to use the software to read and write the tunes to your vehicle, and provides scans, all of which is handled through email exchange. You do however have the ability to make your own adjustments, though it is recommended you do not alter our settings in any way. This setup will require a back and forth transfer of files before you have your initial supercharger tune. 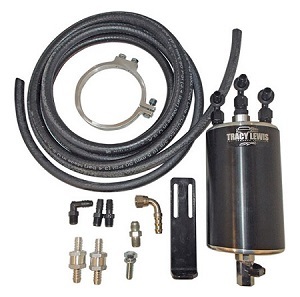 Tracy Lewis Signature Series Catch Can System - Most efficient catch can on the market, effectively removes oil vapors, managed crankcase ventilation with blow-through supercharging, greatly improves engine life, designed specifically for our supercharger system! 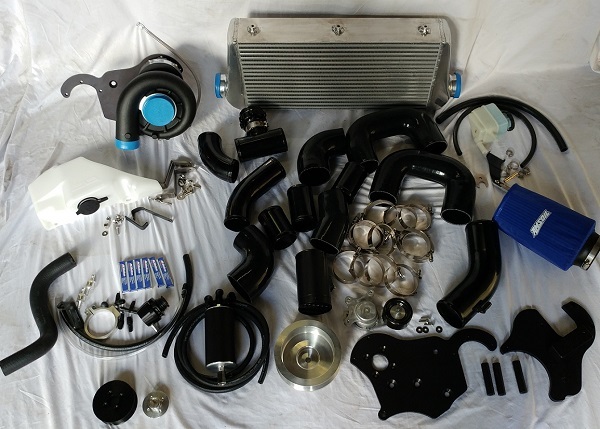 Supporting Items such as a set of AC Delco colder spark plugs, boost sensing MAP sensor, CNC aluminum MAF sensor housing with airflow straightener screen, mounting bracket kit for the intercooler with hardware and tools including a tap,and more. Stage 1 base kits ship making 7-8psi on an otherwise factory vehicle, producing 366 wheel horsepower on our first installed 2016 Camaro. No other modifications were performed to the vehicle. Factory this vehicle produced 262 wheel horsepower on the same dyno; our base supercharger kit produced a 104 horsepower increase at the wheels! You do not need any modifications on your vehicle to install Stage 1, comes with everything you need. Aftermarket exhaust work is beneficial but not required. On my own personal vehicle, I run a base kit with all the parts you'll receive, and absolutely no other modifications, and I love it. The path to 500 horsepower 3.6 V6 is with our Stage 2 upgrade kit. The Stage 2 kit builds on the Overkill supercharger kit with a little more boost, a fuel tank fuel pump upgrade and a set of larger DI fuel injectors. The pulley gets swapped to our 3.4" size providing 10-11psi of boost, an increase of 3-4psi. Larger DI fuel injectors provide more fuel capacity and improve the fuel injection timing, important with direct injection engines. The fuel pump is an OEM quality direct replacement to the factory V6 fuel pump and will provide sufficient fuel flow to the engine to run more boost. The fuel tank must be dropped for installation, while the fuel injectors can be swapped by removing the intake manifold. Once installed we consistently dyno around 410-425 wheel horsepower on our chassis dyno, which is at 500 horsepower at the engine even with the most conservative calculations. Maintains excellent drivability and is reliabile for daily use on 91+ octane. Aftermarket exhaust work is recommended for Stage 2 installation. Want to go beyond our Stage kit upgrades? Extra cooling supply is required to run more boost and running methanol injection can help. Methanol spray will help cool the incoming air charge and it will also increase the octane levels inside the engine. It also has the added benefit of cleaning the backside of the intake valves! The Overkill kit is so simple we've named it the SMI - Simple Methanol Injection kit. A top quality pump and top quality components will use the windshield washer fluid bottle and aside from mounting the pump the installation is very easy, with the spray nozzle preinstalled into a new elbow for the throttle body connection, and a wiring harness that requires a few inline connector connections but no cutting and crimping. The system activates at 2-3psi, there are no boost controllers to mess with or worry of failure. The pump is compatible with 100% methanol, we recommend a minimum of 50/50 mixture with distilled water, you can get premixed fluid from several methanol injection suppliers or pure methanol is available at many home improvement stores. Use this injection system to reduce existing knock retard or to run a smaller supercharger pulley, we recommend the 3.2" pulley if you have Stage 2 which will produce 12-13psi at-near sea level altitude. Q: What's a detailed list of what's included in this kit? Can I use my existing catch can, why is yours special? A: We include our catch can system and require you to use it for your own benefit. The internal canister on our system uses a highly effective, patent pending design, however the set up of the system is vital for supercharger use. On the 2016 Camaro, there is no manifold vacuum feed, so the first thing we include is our machined throttle body spacer which adds a vacuum port for the catch can system. Without this feed, there will be no suction to draw air from the crankcase under idle and cruise, and can allow blowby into the combustion chamber with a sudden buildup of positive pressure. Then, when the intake manifold is pressurized with boost, this line closes via a check valve and uses the suction source from the supercharger inlet to continue to evacuate the crankcase. And as a triple backup, our kit uses a clean side separator in place of the oil cap, which separates oil vapours if the pressure needs to evacuate out the clean side tube for any reason. All of these important features will prevent oil from getting into your supercharger, your intercooler, and into the engine air stream. What power gains can be realistic to expect? A: Factory horsepower on a dynojet is typically around 260 wheel horsepower (measured at the wheels). Our base kit is set up to produce 8psi of boost at peak. You can anticipate your kit making around 370 wheel horsepower with no other modifications to the vehicle, and upwards of 400 wheel horsepower with additional exhaust and intake manifold modifications. Stage 2 with 10-11psi of boost aims to add roughly 40 horsepower over these figures, so anticipate up to 440 wheel horsepower with recommended aftermarket exhaust modifications. We will work on additional supporting modifications to bring power increases upwards of 500 wheel horsepower with reliable results. One of the things we wanted to ensure as part of our design was an independent supercharger belt system. Rather than using the factory OEM accessory belt, our system uses its own supercharger belt and leaves the factory belt completely intact. 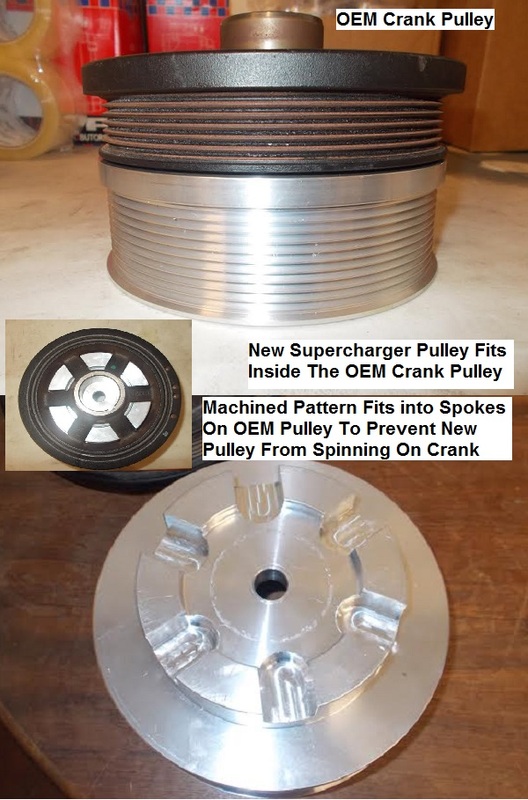 We do this by first installing our new crankshaft pulley. Removing the crankshaft bolt allows you to slide the new pulley as an insert into the factory pulley, and then secure with the bolt. The new pulley indexes into the spokes of the OEM pulley so it is locked into place and cannot slip. The supercharger is spaced appropriately not just for its own belt but for an 8-rib belt. Rather than using the 6-rib factory belt, a wider 8-rib belt will reduce belt slip issues as we start to get smaller and smaller on the pulleys. We can do this because we are not limited using the OEM accessory belt, this can only be accomplished with a dedicated supercharger belt. 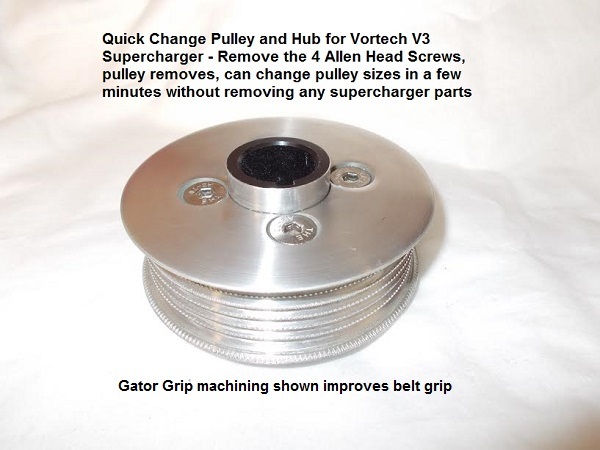 We have developed a quick change pulley system for the Vortech supercharger. This means we can run our own pulley sizes and is part of the 8-rib conversion. It also means you can change your pulley sizes very easily. 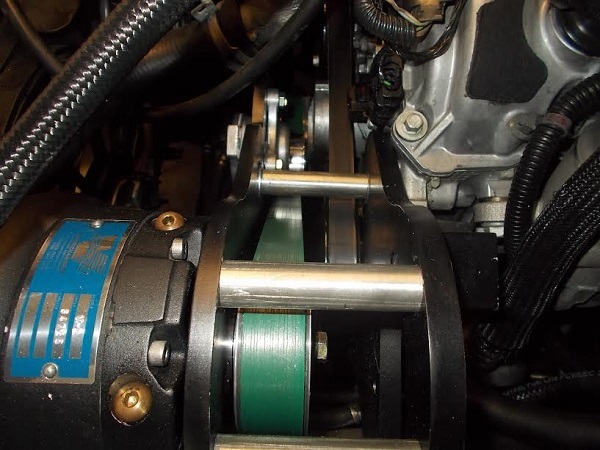 Due to the spacing built into our system mounting plates and the new supercharger positioning, you can access and change the supercharger pulley in a matter of minutes, simply by removing the 4 retaining screws and removing the belt. In smaller pulley sizes, we have a Gator Grip tooth pattern to the ribs of the pulley that will provide the belt additional grip on the pulley but not wear out the belt prematurely. One item that we decided to include standard rather than have as an upgrade is the intercooler. It is important to understand that all intercoolers are a flow restriction to some extent, and their size plays an important role in cooling and flow capabilities. 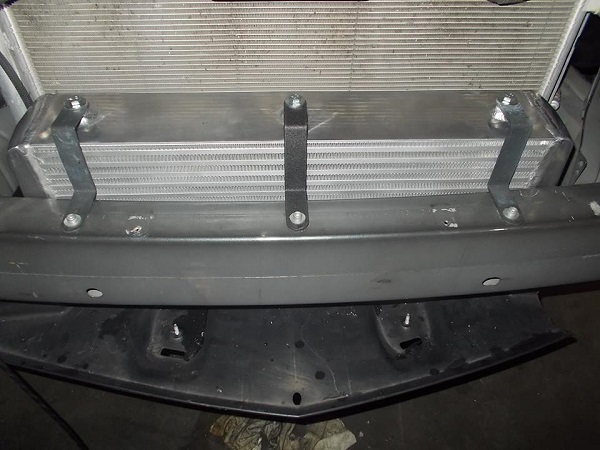 Our air to air intercooler uses a 24 inch long core (side to side) and 4 inch deep. This is longer and thicker than what used to be the standard for a Camaro supercharger kit. The longer the airflow stays in the heat exchanger, the better the cooling. The extra thickness provides larger air passages which improves flow capability, which will make the supercharger boost more efficient at reaching the engine. This core fits with only minor trimming of some of the plastic shroud around the radiator. Our Catch Can System included with each supercharger system is set up specifically to perform with forced induction. Unlike a generic catch-can which connects between the intake manifold and engine on the "dirty side" of the PCV system only, ours connects to both sides of the PCV and provides two suction sources for the dirty side crankcase. When the intake manifold becomes pressurized, the catch can looses suction from the manifold, and the crankcase can become pressurized with boost pressure; our catch can uses a check valve to close and prevent boost from pressurizing the catch can, and a secondary suction line connected right before the supercharger inlet actually uses the vacuum created by the supercharger to continue to draw air from the crankcase. As an extra backup, a clean side separator attached to the oil filler cap separates and prevents oil vapors flowing down the clean side line into the intake path. The entire system means that oil will stay out of the supercharger inlet, out of the intake manifold, out of the intercooler, and reduces blowby at the piston rings, all of which improves engine safety, supercharger lifespan, and overall performance.